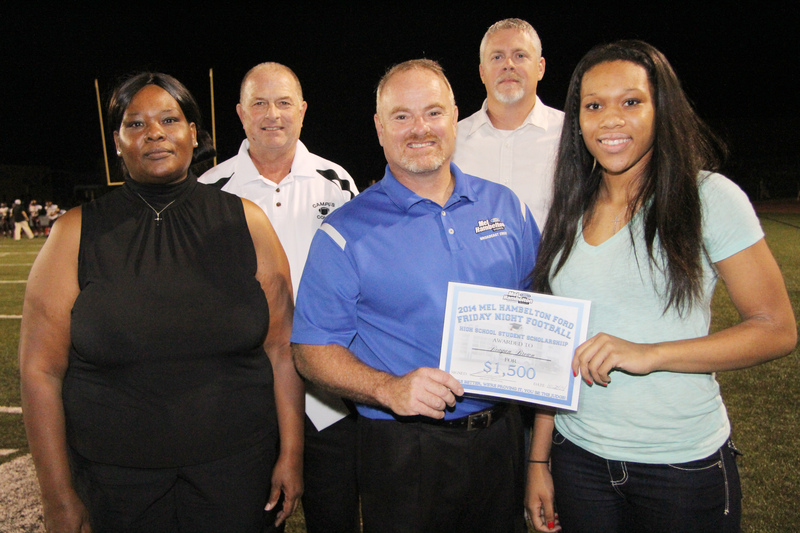 Campus High School Senior Reagan Brown (right, front row) was presented the 2014 Mel Hambelton Ford Friday Night Football High School Student Scholarship as her mother, Bernadette, (left, front row) watched. Reagan participates in volleyball, basketball and track and has earned a 4.18 GPA. She plans on becoming an Obstetrics Nurse. Carl Crossette, Marketing Director for Big Corner Creative, (center, front row) represented Mel Hambelton Ford when awarding Reagan the $1,500 scholarship at the Campus Colts football game on October 24. Mel Hambelton Ford also gave CHS Principal Myron Regier (left, back row) a check for $1,500 and the CHS Booster Club President Kevin McMullin (right, back row) a check for $500.